The CSP&P Railway was incorporated for the educational purpose of expanding the general knowledge of the role that railroads have played in our lives and history, with a focus on the inventions and developments involved in railroads in America and the World and the metal working and fabrication skills and techniques of this same era. The Canton, St. Paul & Pacific Railway is a 1 1/2" scale live steam railroad. The phrase "live steam" refers to any scale model that operates in the same manner as the full size prototype. "Live steam" can be stationary engines, traction engines, boats, and, in our case, railroad locomotives. Throughout the history of live steam railroading, scale steam locomotives have comprised the majority of locomotives being built by hobbyists; however, in more recent years, more enthusiasts are building scale models of modern diesel-electric locomotives. Unlike scale steam engines which operate exactly like their full size counterparts, these are usually gasoline or electrically powered. Located on twelve acres of virgin forest that are protected by the Southeast Regional Land Conservancy, our railroad was built and is maintained by a handful of hard working members using mostly hand tools, picks, shovels, and steam or diesel locomotive power. The track gauge is 7 1/2" inches. 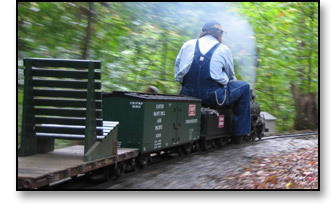 While most of the live steam community builds in 1 1/2" scale there has been a growing trend over the past few decades to build narrow gauge equipment in 2 1/2" scale. This equipment, while much larger, uses the same track gauge, 7 1/2". Live steam locomotives and rolling stock are generally built by individuals in their free time in their own machine shops. Equipment is transported to and from the railroad with pickup trucks, trailers, etc. This methodology allows live steam hobbyists to take their equipment to other live steam organizations across the country. The greatest asset of the live steam hobby is the acquired knowledge of all its members. The sharing of this knowledge, the friendship, and community surrounding the hobby are what make it so very important, and enjoyable, to those who participate. The CSPPRY is a 501-3C (non profit educational) organization and is completely private. Visits to the CStP&P are by invitation only. Fellow large scale railroaders should make initial contact at least two weeks in advance of desired visit. The CstP&P has a limited number of memberships available. Please contact railway president Richard Ruggles for more information.